The symbol of Unitarian Universalism is the Flaming Chalice. The flaming chalice is a cup holding a flame – symbolizing the light of truth, the warmth of love and the energy of positive action. The flaming chalice has become the shared symbol of Unitarians and Universalists around the world. Some families set aside time to be together each week, perhaps on Friday evening at or near sunset, or perhaps on Sunday evening before dinner. These are good times to pause and catch your breath as a family, while you light a candle or a flaming chalice. We light this chalice for the light of truth. We light this chalice for the warmth of love. We light this chalice for the energy of action. You can make your own chalice with a flower pot! Simply purchase a tera-cotta flower pot, and saucer. Turn the pot upside down and place the saucer on top. Glue the saucer to the top with craft glue. Add a candle and viola…you have a chalice. 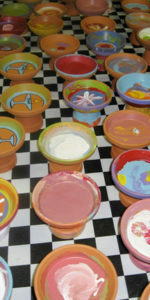 You can decorate your flower pot with paints, crayons or we recommend oil pastels. Your children will love lighting a chalice that they helped to create. tick them on to the wine glass in a random pattern. Paint a thin layer of modge podge or glue over the finished glass to seal it.